The Checks and Balances Project has obtained and posted the controversial new study by the U.S. Energy Information Administration (EIA), "Direct Federal Financial Interventions and Subsidies in Energy in Fiscal Year 2010." According to Brendan DeMelle of DeSmogBlog, even the acting Administrator of EIA, Howard Gruenspecht, reportedly called the report "garbage" and "reminded staffers within earshot that the EIA was a government agency that was supposed to do impartial analysis, 'not provide talking points to members of Congress.'" Having worked at EIA for more than 17 years, including as a senior economist, I can attest to the integrity of the people who work there, as well as to the value placed on EIA's independence by its management. It is with that perspective in mind that I looked through this report. In doing so, I was struck by several things. First, EIA was very clear where the request for this report came from -- three members of Congress, all of whom have received significant donations over the years from the oil and gas and fossil-fuel-fired electric power industries. In addition, all three of these representatives clearly have pro-fossil-fuel agendas, as you can see from Project Vote Smart's issue ratings. For instance, Rep. Bartlett and Rep. Chaffetz each received an abysmal, 10% rating from the League of Conservation Voters in 2010, while Rep. Blackburn actually received a zero rating. Clearly, these representatives are no friends of clean energy. Second, EIA was direct that the way the Congressional inquiry was formulated specifically excluded a number of important government handouts to dirty energy -- accelerated depreciation schedules, tax deductions, limits to liability, etc. The report didn't even touch the vast amounts of permanent, serious damage to public property and health ("externalities") caused by the fossil fuel industries. Including these factors would have made an enormous difference in this study, but EIA was specifically not allowed to consider them. Third, even with all the restrictions placed on EIA by the three fossil-fuel-friendly representatives, if you closely examine this report, it actually comes out quite well for the major "renewables" -- wind, solar, and geothermal. 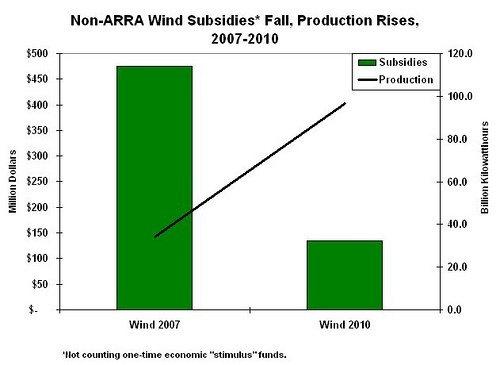 Take a look at Table ES2 ("Quantified energy-specific subsidies and support by type, FY 2010 and FY 2007) in the EIA report: “renewables” received about $8.5 billion in non-ARRA (one-time-only economic "stimulus" money) “quantified energy-specific subsidies” in 2010. Of that total, however, about $7.6 billion went to biomass or biofuels (e.g, corn ethanol for use as a transportation fuel). As a result, only about $525 million of non-ARRA-related subsidies in 2010 went to solar ($346 million), wind ($134 million) and geothermal ($45 million). By Brendan DeMelle, originally published at DeSmogBlog.com; cross-posted with permission of the author. Fuel Fix: Frackers Subpoenaed by SEC? According to FuelFix, it appears that natural gas "frackers" could face a new obstacle to their expansion, in addition to opposition from communities across America to the threat that fracking poses to water supplies and public health. According to new data from the U.S. Energy Information Administration (EIA), it appears that coal may not be "king" for much longer in the U.S. power sector. "What's Worse Than a Coal Power Plant?" Could Solar Panels on Mountaintop Removal Land Help Power America? Time to Pay Our Debt. The "Carbon Debt," That Is. A new study, entitled "The Impact of Candidates’ Statements about Climate Change on Electoral Success in 2010: Experimental Evidences," is discussed in Tuesday's Science Daily. The results are encouraging for clean energy. "Clean-Energy Technologies aren't 'Cute,' but Critical to our Energy Future"